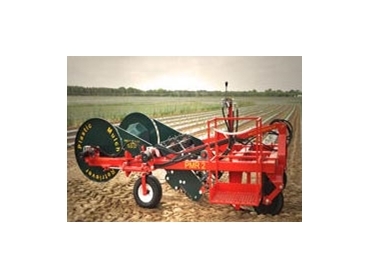 PMR II Plastic Mulch Retrievers from Rocca Manufacturing are specifically designed for the removal of plastic in heavy soils. PMR II Plastic Mulch Retrievers have been designed and built with strength as a priority. And the newly constructed cutter bars are designed to prevent the tearing of the plastic mulch and to ensure a smooth run of the machines in the field. In addition, their belt driven shaker chain ensure less wearing and excellent durability. The use of a rubber belting system provides an extremely effective elevating procedure, even in the heaviest soils. The PMR II Plastic Mulch Retrievers are easy to operate and are built to save on costs and to reduce labour time.